As of late, I keep having nightmares and frankly, I’m kinda sick of it. Honestly, about once a week, I have a nightmare about the zombie apocalypse. And about once a month, I’ll have a nightmare featuring a crocodile. The undead and crocs. I don’t know. It’s not like I’m up all night wrangling alligators or something. We don’t even have crocodiles in California. And I’m positive I’ve only seen one all of two–maybe three–times and they were in a little habitat at Six Flags. Not crawling around my living room or in my backyard. And besides my love/hate relationship with AMC’s The Walking Dead, I don’t indulge myself in zombie things. No zombie movies, no zombie shows, no zombie books… nothing zombie. I like my characters to be living and not bleeding and oozing, thank you. So WHY do I keep having dreams about zombies and crocodiles? What does this mean in dream-land world?! According to this website, it says crocs and gators represent a hidden power below the surface, like a hidden danger. They’re out of sight (under water) yet completely aware of their above-ground surroundings. And the zombies? Apparently it represents running from stress that continues to follow me into dreamland. I wonder what kinda stress materializes as some funky blood-hungry zombie in my dreams. Brit Lit, is that you?! And last night, to make me sound even more like a crack head, I had a zombie apocalypse dream with an alligator AND! featuring safari animals. I swear I am drug-free! Needless to say, I had a very rough night of sleep fighting off leopards and bears trying to eat our family dogs and woke up more exhausted than I’d been when I first went to bed. Don’t you love that? Thankfully, I had the day off and spent it cleaning like a maniac and realizing I was quite happy that there were no alligators in my backyard. Also: I made some popcorn. 2) I underestimate the cook-time and pull the bag out before it’s done, resulting in a handful of half-popped kernels and a bagful of just kernels. And I am not that person who eats the kernels. You know those people. Ergo, I hate making popcorn. 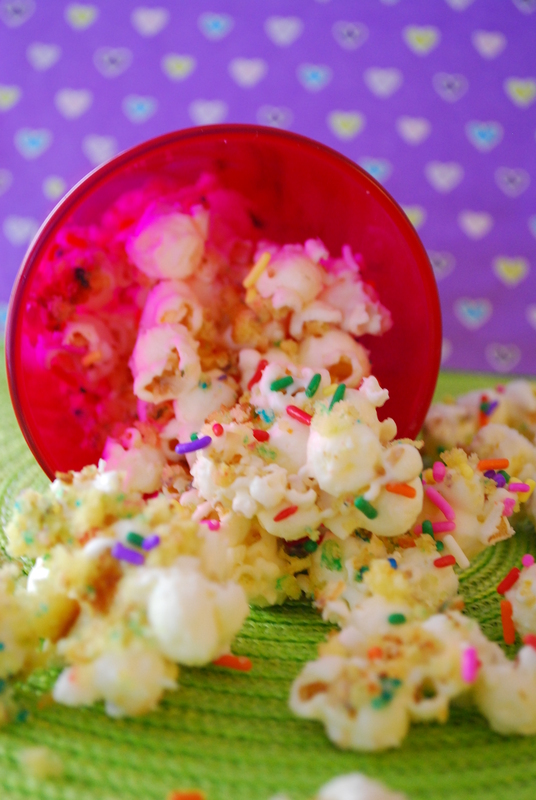 But I wanted to try something new and after seeing this divine creation over on Shelly’s blog, I realized I needed to step out of my comfort zone and conquer my nightmares in real life, popcorn being one of them. 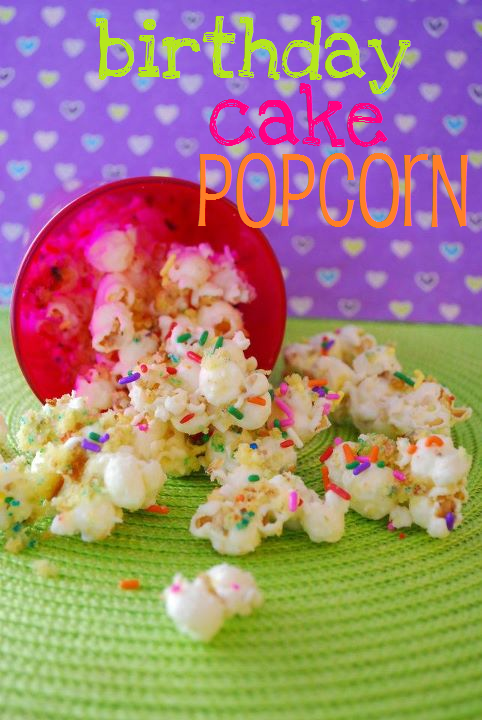 To do this, I had to smother my popcorn in white chocolate, Funfetti cake crumbs and rainbow sprinkles. But uh, you could do whatever you want. This is my nightmare, after all. You’re just included in it for the ride. 1. Melt the white chocolate according to package directions, until smooth and melted. 2. In a large bowl, combine the popcorn with the white chocolate and blend with a rubber spatula or spoon until completely coated. 3. Spread the coated-popcorn mixture onto a wax-paper-lined counter top or work space in an even layer. 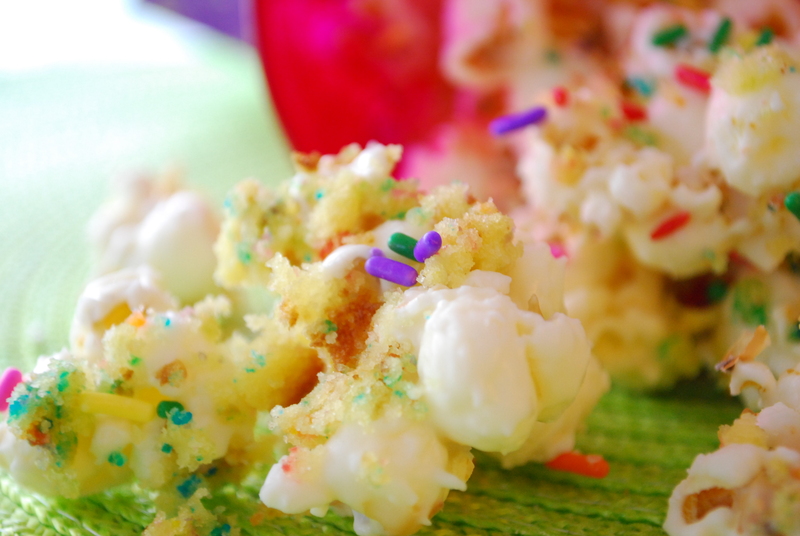 Immediately top with a liberal sprinkling of the cake crumbs and the rainbow sprinkles. Allow popcorn to harden and set, about 20 mins, before breaking into pieces. 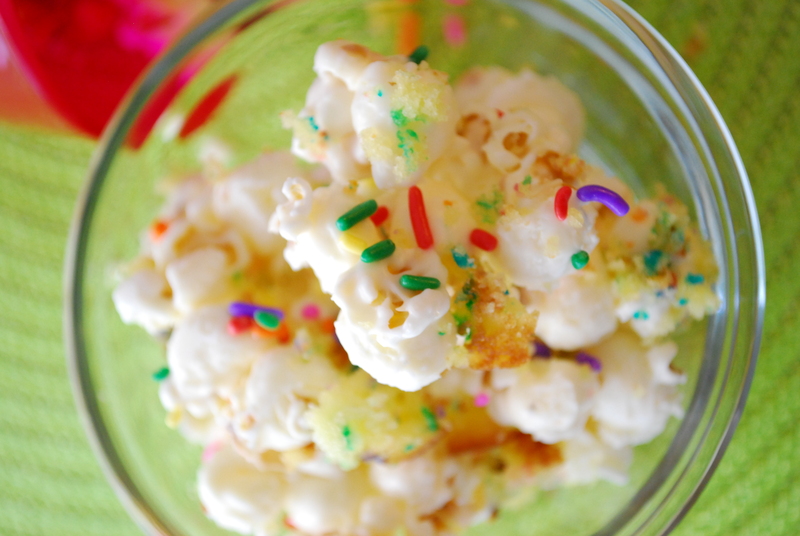 Store this popcorn airtight for up to 2 days. **Note: I baked up 24 unfrosted Funfetti mini cupcakes and shredded them into crumbs once cooled. To save myself time (and ingredients) I found a small box of cake mix at the store that supposedly made 12 standard-sized cakes. Buy this if you can since you won’t need a whole cake’s worth of crumbs. See? Easy peasy! Nothing burnt, nothing impossible to eat. In fact, quite the opposite–it’s too perfect and I ate it all. The zombies told me to do it. Hmmmm….maybe the nightmares stem from all the goodies you make? Like the hidden danger in the fabulousness of cake batter? This popcorn is amazing. It’s a must have! I’m a fan of anything cake-batter! This looks soooo good! *picks up jaw off of floor*. I’m eating a bowl of popcorn right now and I’m sad I don’t have any cake mix to put in it. But in all honesty, if I had cupcakes, I would probably just eat them plain. And then eat some more popcorn. Elizabeth, I second that!! Yum!